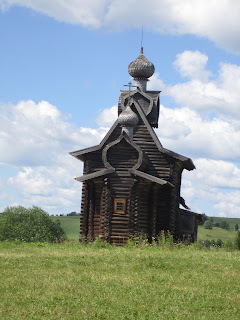 Last week on Wednesday, the American team along with a group of students/Russians went to a small village town on the outskirts of the city of Perm. 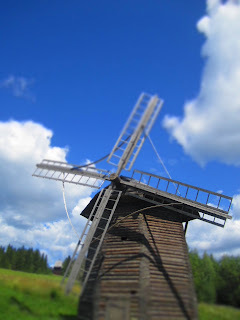 It is a little log-cabin village called "Hoakh-loaf-kah" which is set up to depict what kind of life Russians used to live in centuries past, preserving little log cabins full of old stoves, dolls, or basements; sturdy, beautiful churches of old Russian Orthodox nature; and lots of fun little treasures; such as creaking windmills or tiny little wooden swings where we could all swing and blow bubbles to our hearts' delight. It was such a fun, easy-going experience. We hiked up a tall hill, a vibrant green with thousands of blooming wildflowers all along our path- daisies, lilies, pansies, peonies- and as we continued to reach the top, the village below that is actually resided in today was in our majestic view. We also spent time walking down beaten paths and wooden staircases to the lake below, surrounded by tall, looming pine trees and rocky edges with the water splashing on the shores. It was beautiful, relaxing, and I once again thank the Lord for allowing me to spend time in Russia's beautiful nature and countryside during my time here. 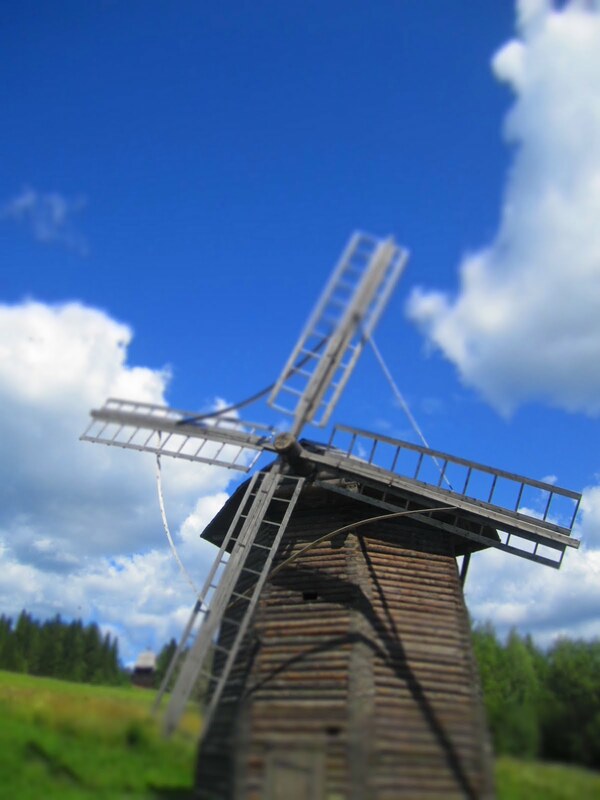 What I loved most of all about our time in Xoxlofka was the feeling buzzing all around our group of family, togetherness, and friendship. We strolled and milled around as we pleased, posing for pictures together or laughing about how our heads were touching the ceilings in the little log cabins. We as adults took turns blowing bubbles, performing magic tricks, went deep into cabins and discovered old barn stalls or hidden doorways, all while having great conversation, laughing together, and enjoying life together. Our time was so blissful and joyful. I am really thankful that it was such a great last outing for the American team as well-- something easy and full of life to share with the Russians we were with. Praise him. The past Saturday night was a marvelous time of fellowship with Elizabeth (a journeyman here), myself, and a group of 5 Russians. We met together because a man named Alex (we call him Alex the Poet, since there are so many Alex's) had spent time with me on the bus ride back from Xoxlofka. On our way back, somehow our conversation had turned to the BIble and why the Old Testament is important. It was so cool to spend our entire bus ride back discussing the beauty and importance and awe-inspiring pages of the OT to him. Afterwards I gave him my bible to read and explore, since he had only ever owned a version of a Russian-English New Testament. He asked Elizabeth and I if we could meet and discuss some questions he had. The conversation that ensued in our group was invigorating, deep, and long-- we discussed the topic of good and evil, how they both originated, what is considered "good" by human standards, and how we should only look to God's standard for what is "good." We spent time talking about the story of Paul, how before his conversion he thought persecuting Christians was "good," and how God changed his heart and his life; we spent time in Exodus on the law, and also discussed original sin and how God sent his son as his plan to rescue and redeem the fallen world, and will send him again. Such a powerful conversation in a room of 7 people from all different walks of life, all different perspectives and beliefs. Nothing that we intentionally planned to happen, but God in his rich blessing planned it, and allowed us to take part in it. 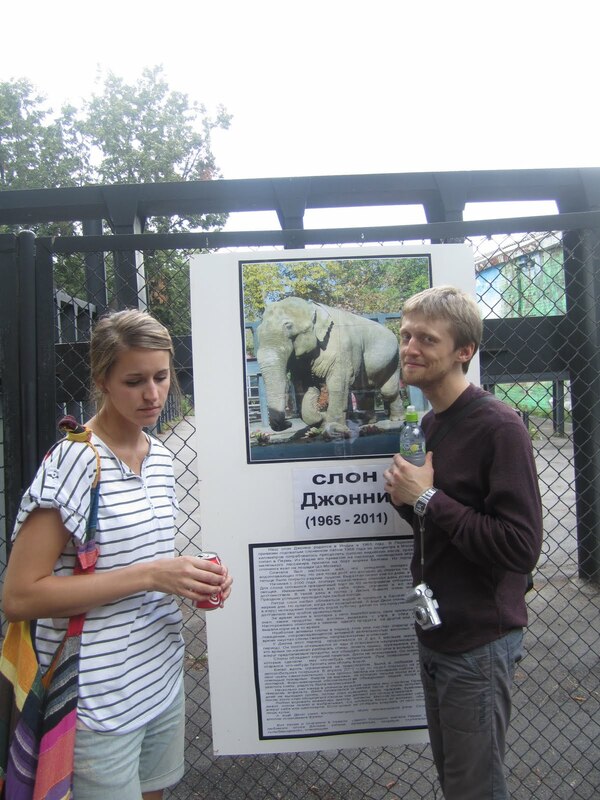 (The above picture of Sasha and I being sad is next to the zoo's Elephant "Johnny" and his obituary...he died a few weeks ago! how sad!) Tonight was another incredible example of how God plans our days, and we just take part in them. I have been worried about my last week here in Perm, and have been sort of stressing about making sure I meet with people and see them before I go. I was afraid but then today I just decided to let go of it all, that I would be able to see people and it all will work how God wants it to. It ended up being a day that was so enjoyable and full of people I love. Elizabeth and I met up with our friend Sasha (Alexander) and went on a walk across the city, meeting some of his musician friends for a while. 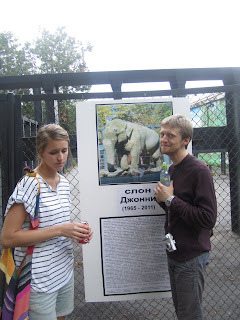 Then we took a trip to the Perm Zoo, which was so unique compared to that in the states. The animals are so close up to you! I was standing 6 inches away from a lion's face. It was INSANE. To my wonderful surprise, our friends Natasha and Rinat joined us at the zoo as well. I was so happy that we were able to all be together. Being at the zoo and looking at God's incredible creativity in his creations sparked some genuine and authentic spiritual conversation. Being able to discuss how uniquely and intricately made the animals are, their feather markings, their attributes and characteristics being so intentional that they had to point to an almighty hand and creator-- it was a humbling and sweet truth to explore. After the zoo, we walked a bit and got some hot dogs and then decided on whim to go back to Liz's for tea and coffee, as well as some sandwiches and banana splits! My Sonic skills were put to work making those for my Russian friends. It was just a really, really beautiful and awesome night of fellowship with good friends. I felt blessed and still feel blessed beyond belief. Overall, I think the point of this post was to reflect on how thankful I am to have built some really great friendships and relationships over here with some really talented, unique, special Russian people, as well as with the American missionaries who are already here. I look back on these few highlighted days- Xoxlofka, Saturday night's small group, and tonight's zoo + banana split evening- and I see a lot of joyfulness in it all. Most of all, I see a lot of God's faithfulness in bringing his people to me, and me to his people. 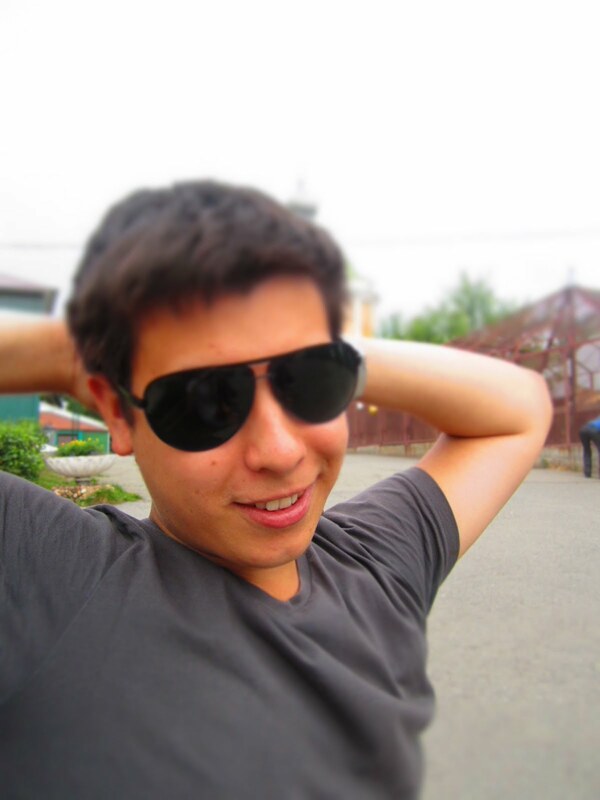 I was so uncertain of how this all would work out when I got to Perm, how I would possibly meet and communicate with people, and it has been almost seemless. He is the orchestrator of all things-- and I get to enjoy and rest in that. I love the people I have met here so deeply, and I can't believe I only have 6 days left with them. Time to make the most of all I have left, and I'm so excited for each day that will come. Really neat you could get that close to a lion !! P.S. Seems like you could be now a Perm guide of places to visit!